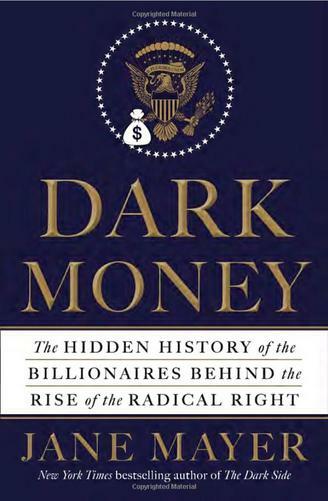 I am developing this blog to spread the message of Dark Money by Jane Mayer: how the stealth fascism of the rich radical right is taking over our country...hope you keep reading! I am writing this blog to help spread the the message of the book Dark Money by Jane Mayer how US politics, in particular the Republican Party, have been taken over by a small group of ultra rich, ultra conservative extremist families and associative individuals who have become the financial backers of the Republican Party and are holding it captive to do their bidding. It is, in fact, a form of stealth fascism, which is worse than McCarthyism in its ideological blindness, far more financially secure than any fringe extremist group like the KKK, and frightening in its depth of methodical planning and precise execution to subvert our government to do its will. If you want to learn the essence of the book in the least amount of time, see the Essential Points page. You can read about why I'm writing this blog on my Motivations page. I hope this blog will prompt you to action and get politically involved...in any way of your chosing, because the only way this threat will be removed is by enough people like you and me changing our politics -- despite all that dark money can do. I will be also blogging on what I believe are the most effective things we can all do, with our limited time and resources, to counteract this dangerous trend. Who's behind the Dark Money network? copyright 2018 by Rick Casey. Simple theme. Powered by Blogger.